In June, Nick’s little brother Quinn visited for a week. When we were trying to figure out where he needed to visit, it was decided that it couldn’t be a European vacation without a trip to Paris. 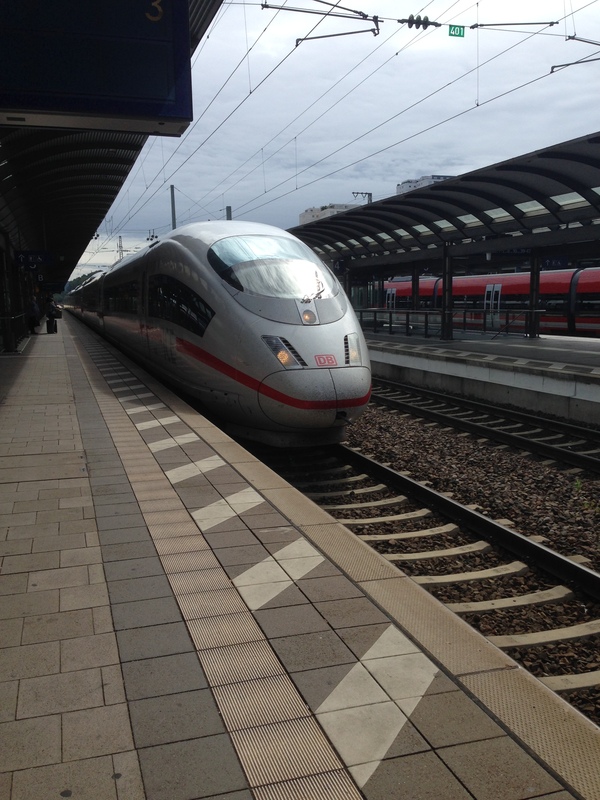 Germany has an extremely efficient rail system called the Deutsche Bahn. It also travels to some international locations. We had heard a lot about it and given that the ICE train travels to Paris in a little over two hours, it seemed like the best opportunity to give it a go. To get the best price you need to book 90 days in advance, but we still got a pretty good price at about 60 days out. Driving to Paris takes about four hours and with the added cost of tolls along the way, the ICE train is a good alternative for a small travel party. We arrived about midday on Saturday. The train was about 15 minutes late leaving from Kaiserslautern, but seemed to make up a lot of the lost time along the way. At one point the train got to about 300km/hour which made the distance fly by. The train arrives at the Paris Est station. When booking the hotel I made sure that we had one on a metro line that leaves from the same station. We chose the Acropole hotel which was at the very end of the Port d’Orleans line. It was a little difficult to find a room in Paris that took three adults, but we were really pleased to find that the Acropole was sizeable and comfortable. The metro was as easy to use as the London tube and covered all of the central Paris area. One journey cost about 1,40 euro each and covered all of the transfers in zone 1. We headed straight out for some lunch and sightseeing. We weren’t able to get Eiffel Tower tickets as they were booked out months in advance and we missed the late release date by a week. Still, the Eiffel Tower is beautiful from the ground and if you are to go up the Eiffel Tower then you don’t have a view of the tour – which really is the pinnacle of the Paris skyline. The weather was absolutely stunning, so we chose to travel everywhere by foot for the rest of the day. My recommendation would be – make sure you wear appropriate footwear and make sure you are well hydrated. Also, don’t forget the sunscreen as it’s not a budget item to buy in the tourist areas. We added a new word to our travel dictionary. ‘Hangry’ has always been well known – when you get so hungry that you end up angry. ‘Thad’ was added in Paris – when you get so thirsty that you get mad. We ended up walking from the Eiffel Tower all the way to Notre Dame via the Louvre museum, before walking up the back streets of Paris to try and find the Parisian restaurant that we had eaten at on the USO tour. It turns out that the restaurant is only available to people in groups! What a let down! In the end, we found an Italian restaurant to eat at that was well in the area that the locals eat at. 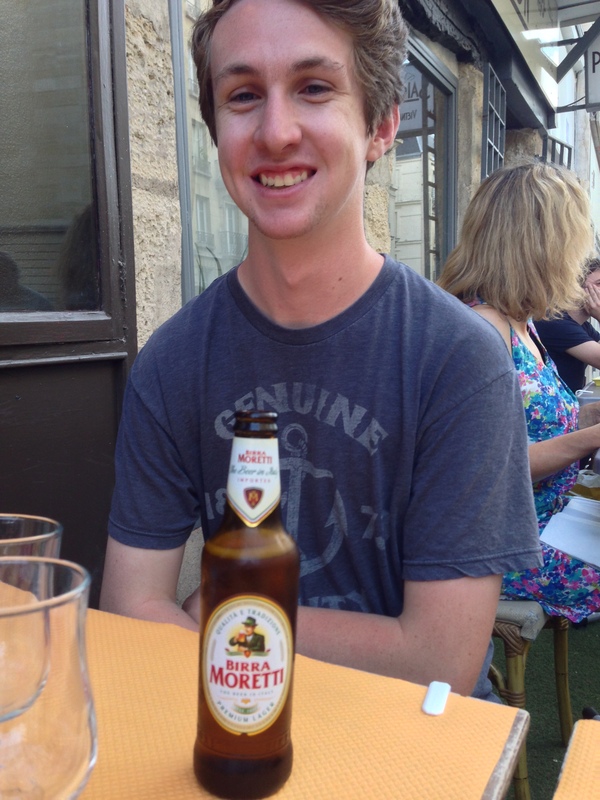 Quinn had a legal-drinking-age beer with dinner and we enjoyed our meals. After dinner (and a small domestic between Nick and I – poor Quinn) we ended up going via a small supermarket to pick up some wine and beer to watch the sun fall to darkness by the Eiffel Tower. The temperature was perfect to do so, and we ended up seeing the Eiffel Tower light up while enjoying the view with many other tourists. The Tower lights up every hour on the hour once dusk falls. Others were well prepared with beautiful picnics set up, so if we were to do it again we would bring along a picnic basket and blanket and eat dinner over a couple of hours. This way we could watch it light up several times. It really is quite beautiful – and much more beautiful when the weather is good! After waking from our slumber we headed down to the local M&S and got some delicious breakfast before heading out for some more sightseeing. 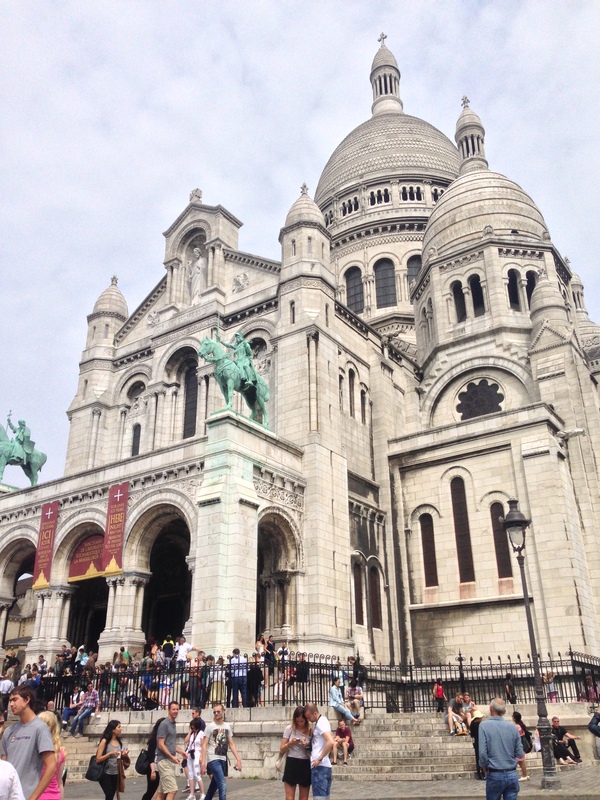 We took the same metro line back past the Paris Est station to the Sacre-Coeur. The church is well known as a Roman Catholic place of worship, however, we were visiting for the views it has over the central Paris area. It was breathtaking – once we made it up there through a slightly sketchy neighbourhood – and absolutely beautiful. The tourist landmark of Montmartre was at the bottom of the Sacre-Coeur, which we wandered around to grab some knick knacks. We eventually walked down back through the streets of Paris, which were mainly closed due to it being a Sunday. In Europe, most non-tourist areas are closed on Sunday. Quinn had not experienced the Hard Rock Café before, so it was the perfect opportunity to introduce him to our travel ritual. He seemed to enjoy the food and atmosphere and we could cross the Hard Rock Café Paris off our list. I did actually stray from my usual of the twisted mac and cheese, but Quinn got it and rated it pretty highly. We exhausted our sightseeing early, so we had to wander around for awhile before catching the train back to Kaiserslautern. The train left promptly on time this time and we were back by about 2100. Next time we go to Paris, we will definitely take the train again. The convenience of not having to drive and find parking and the ease of the metro to get around Paris central makes it a great experience.